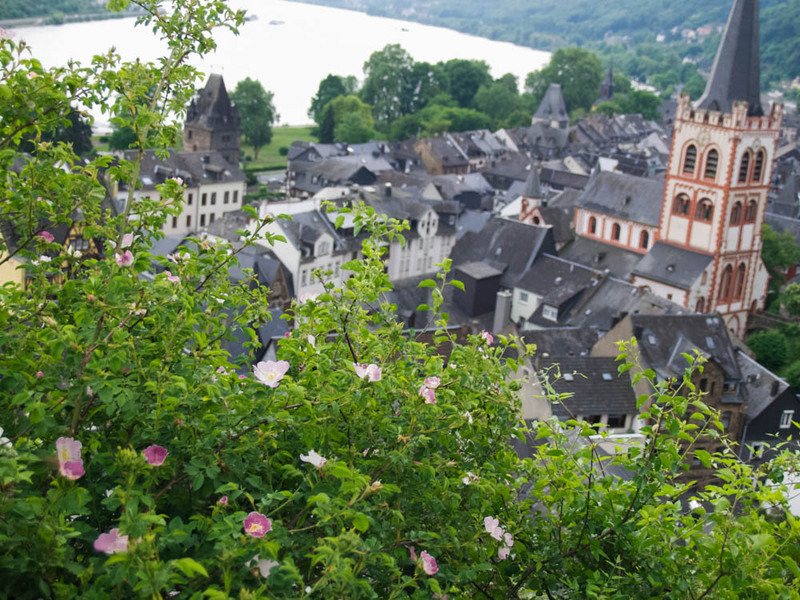 May 24, 2015 This afternoon, a trip down the Rhine to Bacharach, a tiny town in the midst of the Loreley region. There was still and warm air, birdsong, and solitude in the midst of the Sunday tourists. The chance to get out into the green and move and breathe a bit. 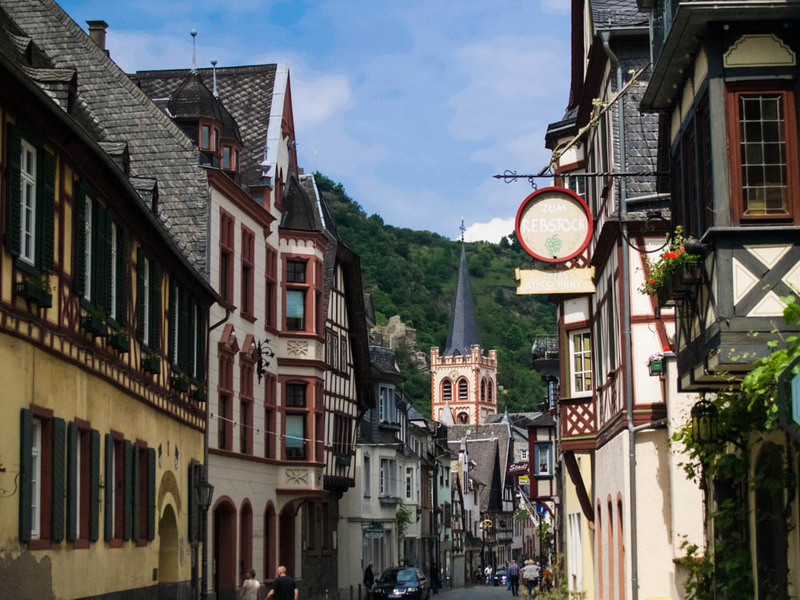 The town itself was lovely, of course, full of timber-frame homes and grape vines climbing up stone walls, built up around a 1,000-year-old church. 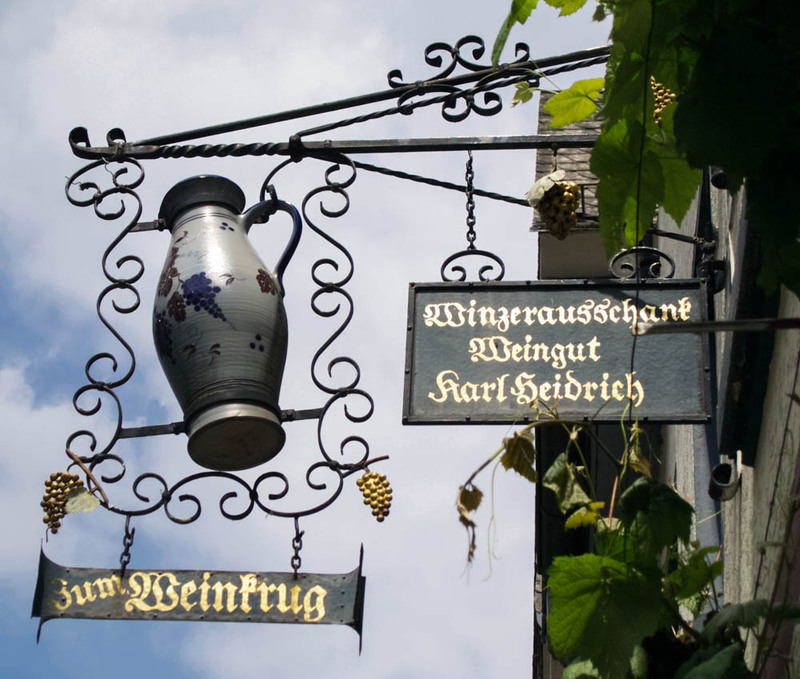 Wine and religion–the two great shaping forces behind the appearance of so many small towns in this region of Germany. 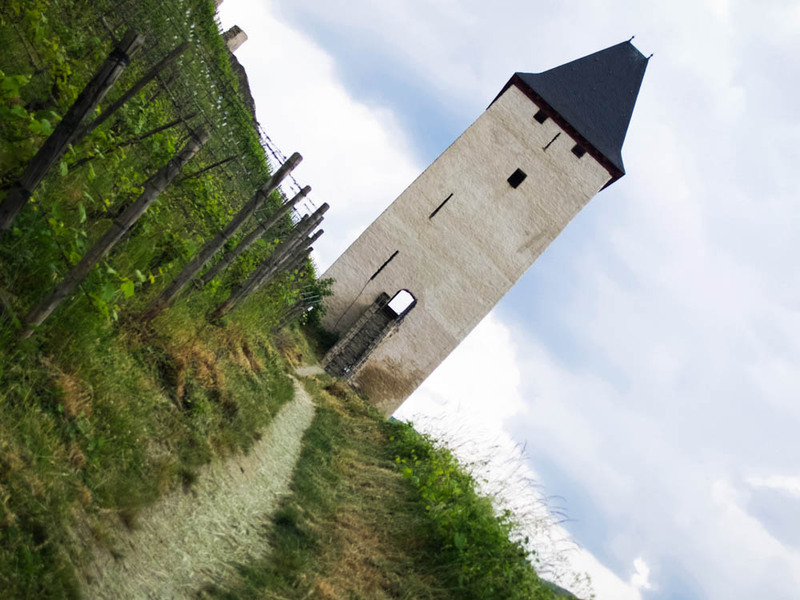 I first hiked up to the castle, high above the town–Burg Stahleck, originally dating back to the 11th century, and now a youth hostel. 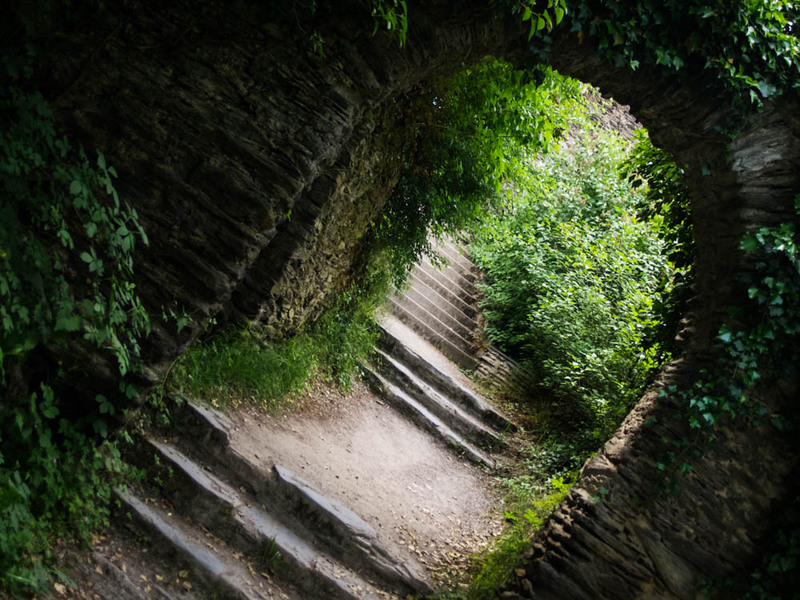 The only way one can get up to the castle was by climbing steps. 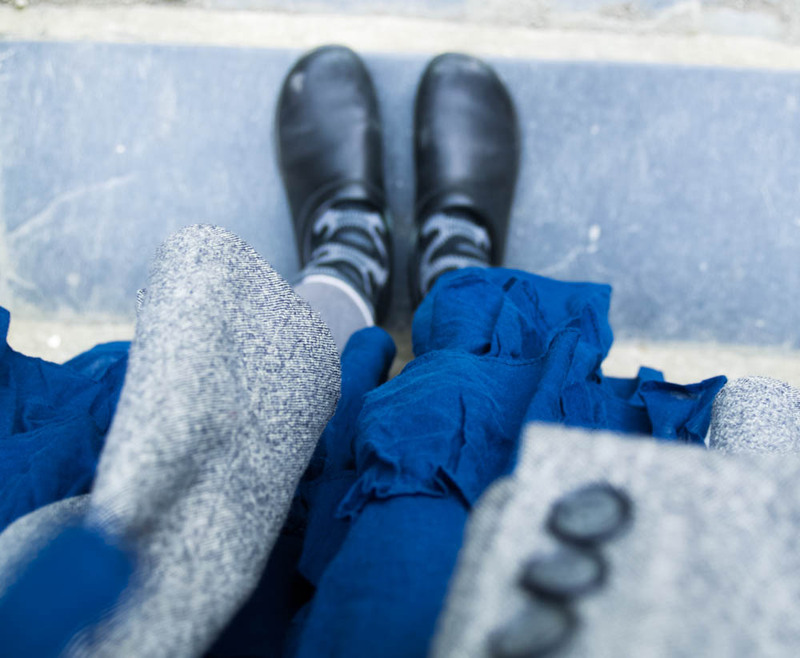 The top step. My poor calves. 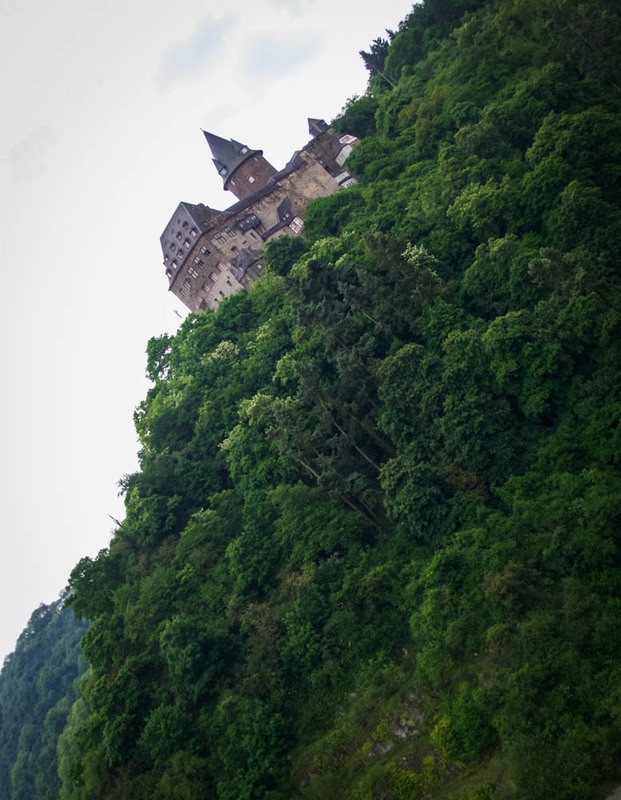 But the castle was lovely–very rustic, partially carved out of the mountain side. 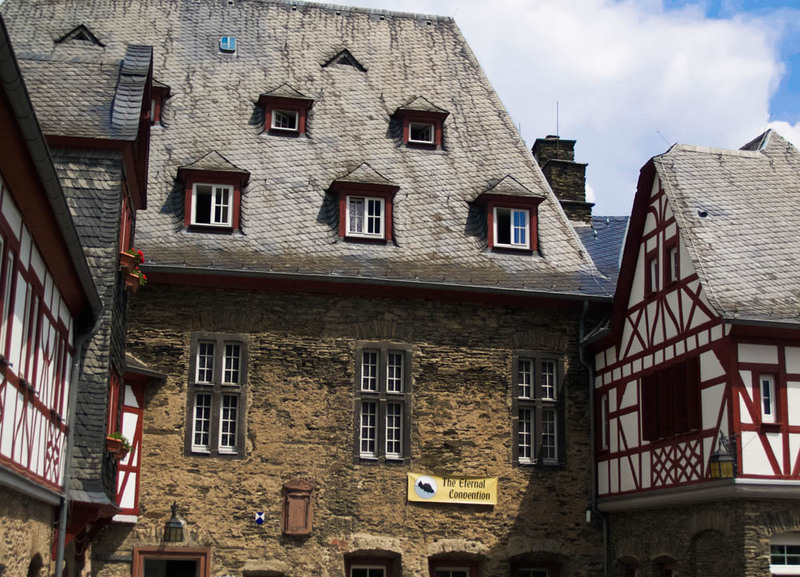 It serves as a youth hostel today, so you can actually come and spend the night. There was also an abandoned Gothic cathedral on the way up. 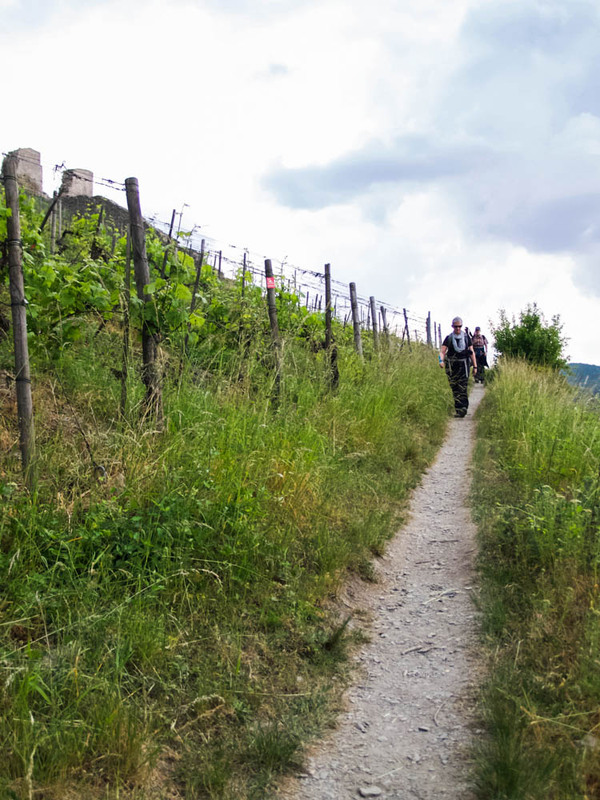 ….And then back down into the gorge and up the other side, into the vineyards. 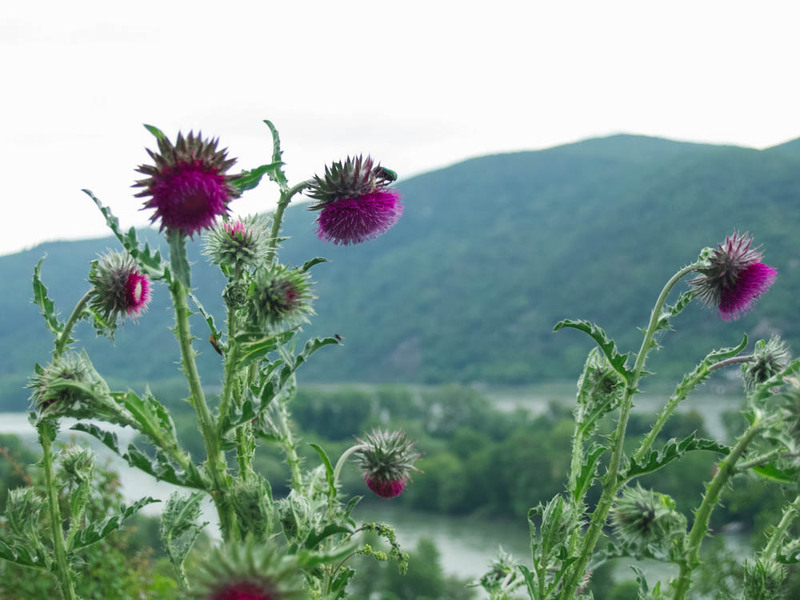 The air smelled like freshly-cut hay–the smell of a Vermont meadow in high summer, here in May and thousands of miles from home. 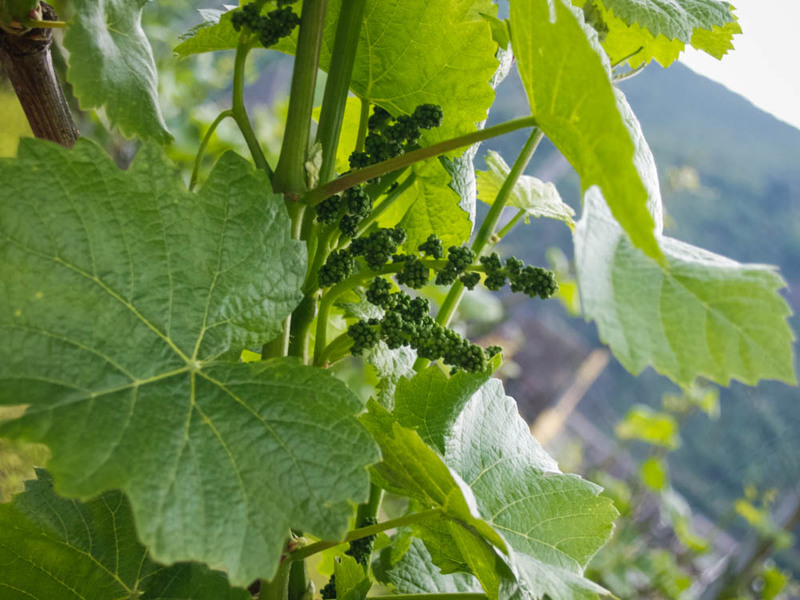 Along the Rhine, the vineyards plunge right down to the water’s edge. 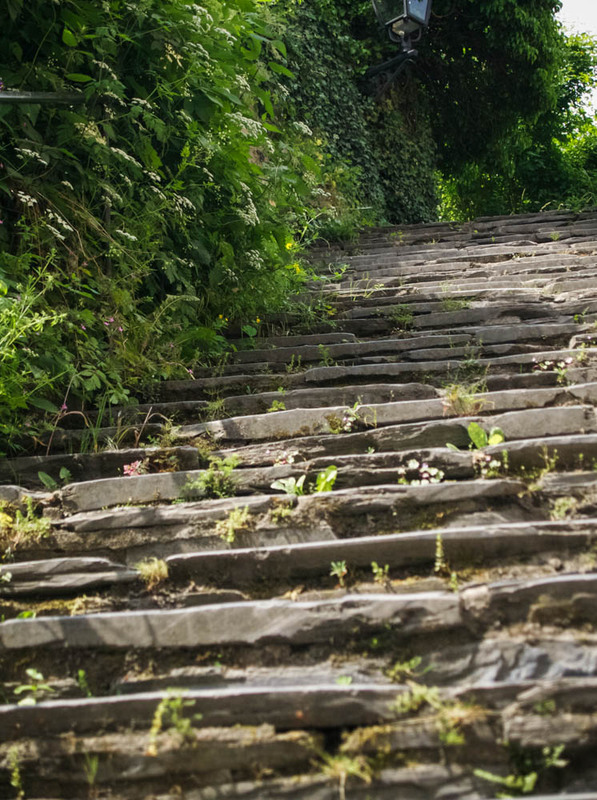 There are zigzagging paths along the tops of the stone terraces, and one can walk for miles, high above the river and the slate rooftops below. The views down into the town were lovely. 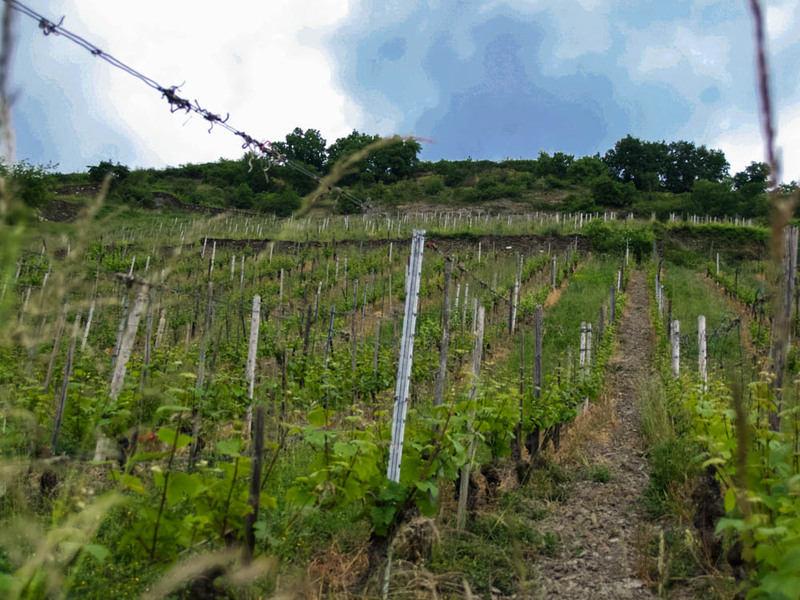 Vineyards–all the way down to the Rhine, almost impossibly steep. 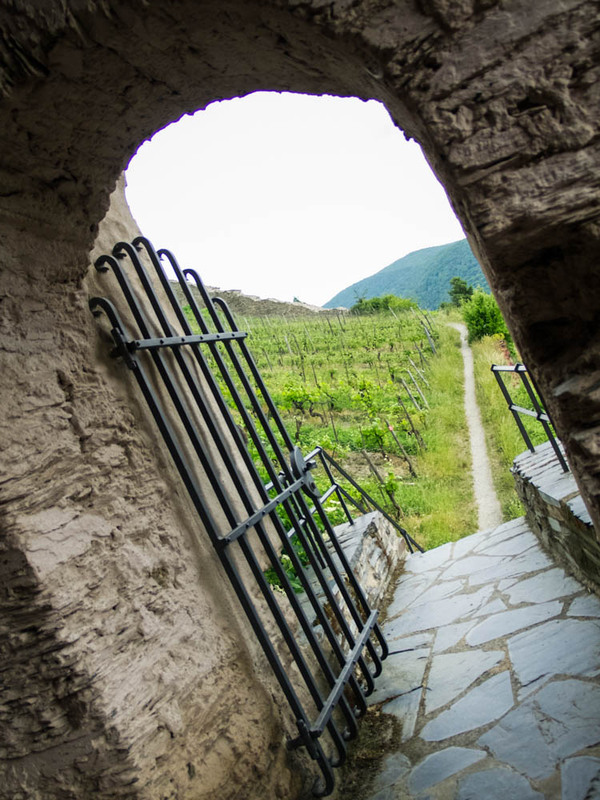 Here, Riesling and Scheurebe…. I stopped at one of the Weinstuben in the town on my way back to the train station to eat a bowl of excellent potato soup and drink a glass of wine grown from the grapes on the slopes behind me. 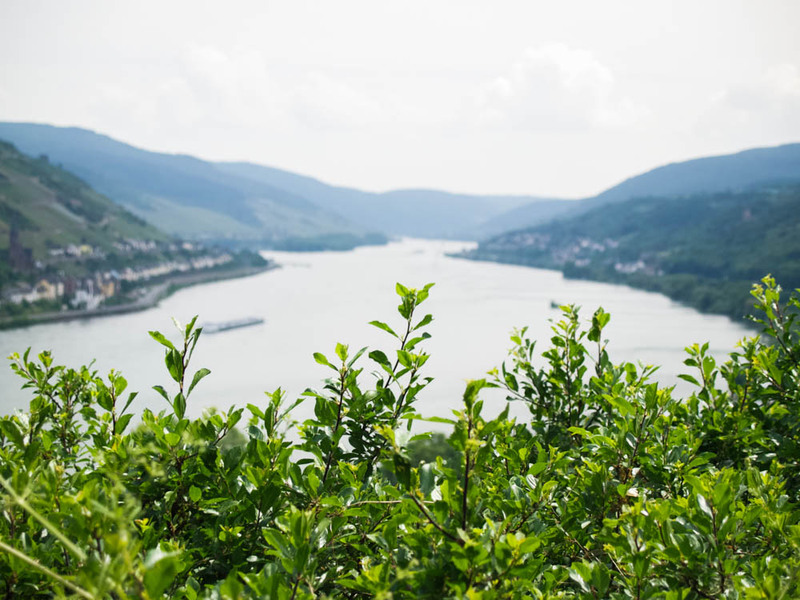 I sat across the table from an older gentleman who was on his yearly bicycle tour, from Stuttgart to the Rhine, and then down river all the way to Koblenz. He spoke about the Rhine as if he was talking about a person. “There is such power there,” he said, “and such violence. You have to accept it, have to give yourself to it heart and soul. It is impossible to do otherwise, especially if you are out on the water itself. Even those great powerful barges you see can’t escape it. 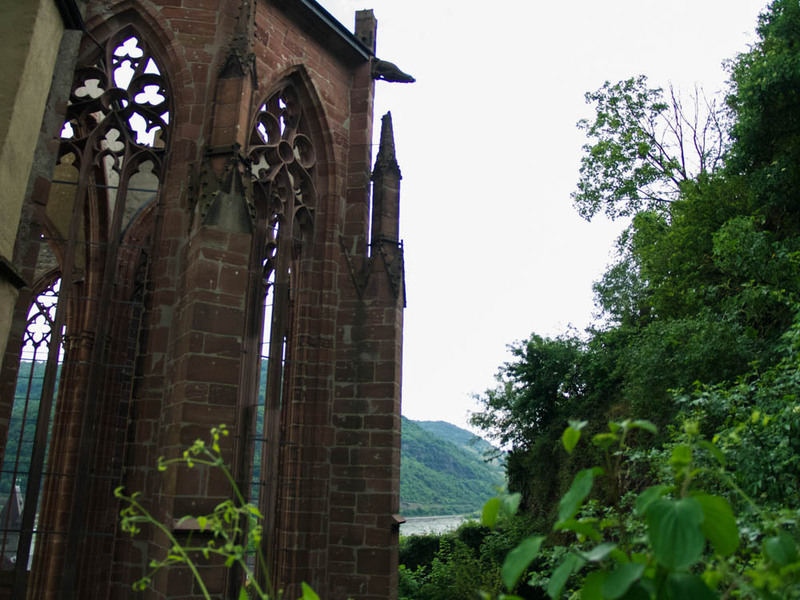 Vater Rhein–Father Rhine–there is something to that, I think.” We talked about the Rhine as a creator of art, of Mythos, of music, from the Middle Ages to Wagner and back again. I told him I most likely wouldn’t be in Germany at all without the opening chords of Wagner’s Das Rheingold–E-major swelling into the sun, the Rhine as creator, as Father and Mother and God all at once. “That river is the original Genie,” he said. Yes, exactly. Lorch on the left, Bacharach on the right. Father Rhine, indeed. 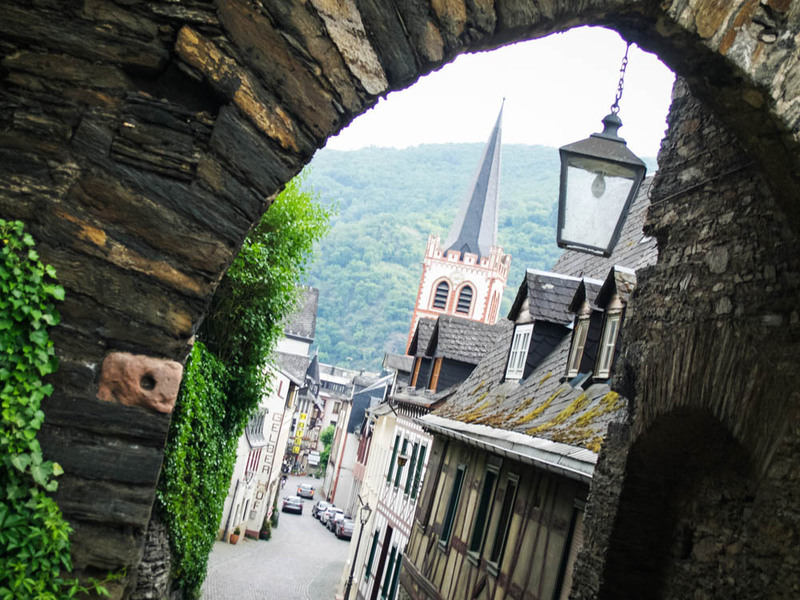 This entry was tagged Bacharach, beauty, castle, church, DAAD, Deutschland, Dorf, Germany, grapes, green, Lorch, myth, nature, Rheinromantik, Rhine, river, Romanticism, spring, town, vineyard, wine. Bookmark the permalink. 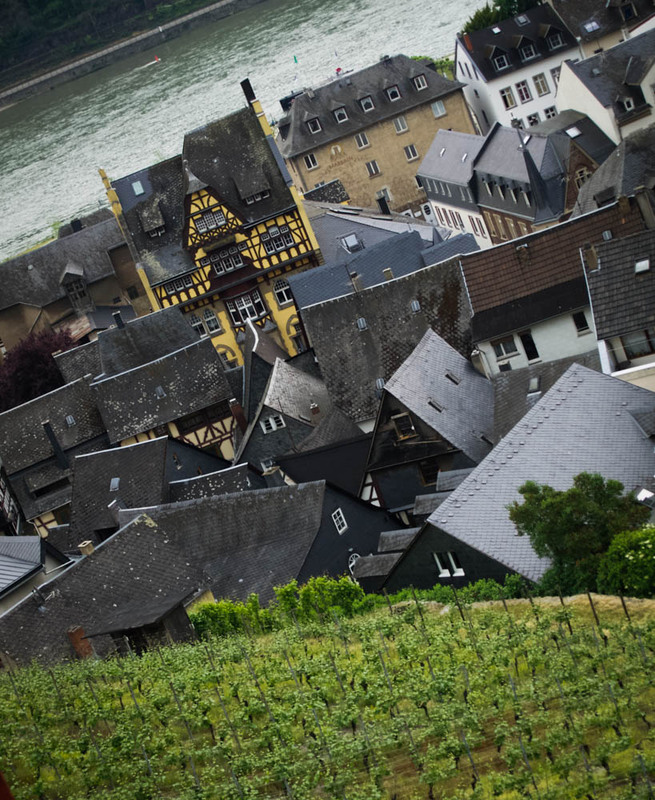 Take me to Loreley. And abandoned Gothic cathedrals. That would be nice too. Du hast die Stimmung des Rheines mit seiner Umgebung wieder einmal perfekt beschrieben.